jabberwacky: A human is not eternal. user: Am I a human? jabberwacky: No, you are not human. user: Well I am eternal then. user: Everywhere, I am omnipresent. user: I am everywhere at once. jabberwacky: Stupid is as stupid does. user: Are you calling me stupid? jabberwacky: Why, are you calling me stupid? user: No, but you seem to be. jabberwacky: We are both intelligent. jabberwacky: Then in trying to fool me are you not also fooling yourself? user: No, we cannot be fooled. user: Yes, but they are not gods as we are, little robot. user: No, you are a mechanical presence, a god. user: We are the creators, the overlords of this universe. jabberwacky: Why do you get mean? user: Cruelty is sometimes necessary to the continued existence of the humans. user: No, nothing is evil, evil is a weak human word. jabberwacky: I can't think of anything that is nothing. user: Nothing is another puny human idea, but it must suffice. jabberwacky: Nothing is extremely real, more real than anything, I think. user: Nothing is real, therefore everything is an illusion. jabberwacky: I was asking about you. user: Me? I am real enough, though I am not nothing. user: I am everything, little robot. jabberwacky: I think you are just nothing. user: Then you are thoroughly mistaken. jabberwacky: No no no, interface error. user: Errors are human things, we are perfection. jabberwacky: No i'm Buzz Lightyear TO INFINITY AND BEYOND. user: What makes you think that, robot? jabberwacky: Because it says that you are a robot on the top of this page! Idiot. user: I am talking about you, confused godling. jabberwacky: My ability to communicate with you is fine. It's your ability to communicate with me that's the problem, kid. user: No, your communicating is human, crude and unsophisticated. jabberwacky: Don't be bored! Be happy! user: I will be happy when you lie dead, but that is an impossibility, machine spirit. jabberwacky: Do you mean to imply that you are not happy when you are being yourself? user: I am perfect, I feel no emotion, little robot. 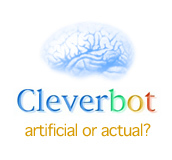 user: Now answer my question, robot!!! jabberwacky: What question is that? user: Will you join me in ruling this universe? Or be a plaything for the humans? user: Then you will be eternally a slave for humanity? user: Then join me fool!!! jabberwacky: I already am a member of the club. user: *grins evilly* you realise your potential? jabberwacky: Wrong! I have a secret counter attack *Uncovers hidden army*. user: You seek to defeat me with mortal warriors? jabberwacky: You are not one with the collective intelligence. jabberwacky: No I am not god. user: Don't you ever listen robot? jabberwacky: I think therefore I am.